Welcome to Legion's Online Store. We invite you to browse our classic designs in Chafers & Buffetware, Cookware, Serving Trays and Accessories. It is our pleasure to introduce you to the celebrated American-made LEGION chafer. Gracing the most elegant buffets for over a century, Legion chafers have embodied a tradition of timeless beauty. Today, we maintain our uncompromising commitment to excellence in design and construction. Available in a wide variety of styles and finishes there is a Legion chafer to enhance any dining room. Our expanded offering includes the bold, graceful Luxor and the stately new Rome lines, as well as our Classic Lion, Classic Traditional, and Contemporary stylings. Legion's exclusive quiet rollback cover opens to 90° and 180° with fingertip touch and no operator adjustments. 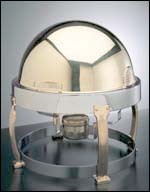 THE NATIONAL BOARD OF THE AMERICAN CULINARY INSTITUTE HAS PRESENTED LEGION WITH THE 2001 AMERICAN CULINARY AWARD OF EXCELLENCE FOR CHAFING DISHES. Legion Cookware, Buffetware and Serving Trays are unequalled in quality, beauty and durability, and have been the choice of great chefs for decades. We invite you to review our product offerings when only the best will do.